Stan and Jan Berenstain introduced the first Berenstain Bear books in 1962. Their son, Mike, grew up watching his parents work together to share these lovable bears with the world. Stan and Jan have both passed away, but Mike is carrying on the work they began, sharing this special bear family with a new generation of young children. 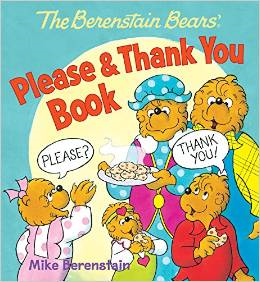 The book I received for review is "The Berenstain Bears’ Please & Thank You Book" for children ages 2 and up. It talks about the importance of manners through gentle reminders given to Brother, Sister, and Honey as they await their milk and cookies. I grew up reading picture books of The Berenstain Bears, and watching some of their cartoon specials. I've always enjoyed the funny things they have said and done and, as a mother now, I appreciate the good values their books/stories express. This new book by Mike Berenstain is no exception. It is sure to be a helpful tool in teaching manners to your little ones. If you would like a chance to add it to your library, enter your name and e-mail address in the giveaway box below. The entries will end at 8:00 p.m. CST on Saturday, February 28, 2015. My Grands LOVE these books. We read at least one each day. I love the stories and the message of the book!